Currently: Mostly Cloudy, and 57 ° F. For more details? Today: & High null°F / Low 50°F.--- Thu: PM Rain & High 65°F / Low 49°F. 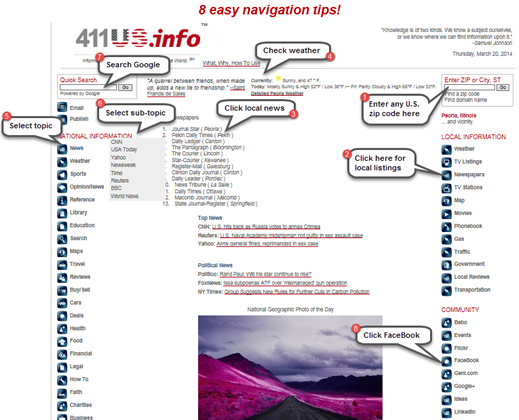 411US.info is an information menu that uses the internet. It allows you to flip from local to national to community information on one page. 411US.info is fast and easy to use. You don't have to type. Just point and click. Your choices are always on top for quick access. Choices are clear, concise, and organized by topic. The choices are pre-screened, providing trustworthy, best-of-the-internet websites to you. After you enter your zip code in the upper right box, local information is tailored to you. To find Local information, enter your zip code (or City, ST) in zipcode box in upper right. To find a list of local newspapers' websites, click "Newspapers", then click one to view it. To clear the list, click "Newspapers" again. To find National Information, go down the categories on the left. Hover over a category to display the sub-menu. Click your choice to go look. Browse down these categories to look around at your choices of super websites. To go to Facebook (or other social network), go to "Community" and click your choice. Your choices open in new tabs (or windows). 411US.info stays open as a home menu for you to come back to. To do a quick search, use the search box in the upper left. To try translating pages, click a flag in the lower right. Give us feedback to help us improve the site. Once you begin to navigate the site, this information will disappear. You can see it again by clicking the link at the top What, Why, How To Use. Copyright © Jerry Guzi & Company, 2007-2019 Affiliate Notice All websites linked to are Copyright © to their respective owner(s).